Clifton Alapa was born in Hawaii and was a gifted multi-sport athlete in baseball, basketball, track and football. Alapa attended Arizona State and came to the Alouettes via a free agent camp. Alapa attended a free agent camp in Los Angelas, and was one of only two players out of 500 invited to the 1977 Als training camp. Alapa started 12 games in his rookie season, filling in due to injuries to Gordon Judges and Junior Ah You. Alapa and Ah You were good friends, both coming from the same town of of Kawuka Hawaii. Alapa started the 1978 season with the Alouettes, was released and finished the 78 season with Hamilton. Alapa went to training camp with the Tiger-Cats in 1979, but left camp to take a construction job, as he was questioning his future in football. 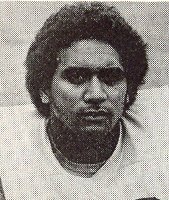 After a year out of football, Alapa signed with the Winnipeg Blue Bombers in 1980, but didn't make the team. Alapa would later play two seasons with the Los Angelas Express (1983-84) of the USFL. Tackle and sack stats were not kept during these years.